And Neymar has gone with them. He is one of the finest players in the world, and I admire his undoubted talent. I also know that he is dedicated to his profession, and a superb professional. He has, however, been heavily criticised from all angles during the tournament in Russia for the way he rolled along the ground after a tackle here and there. He hasn’t covered himself in glory, that’s for sure. Neymar hasn’t been the only one guilty of that, but his incidents have been the most high-profile and gained the most attention. 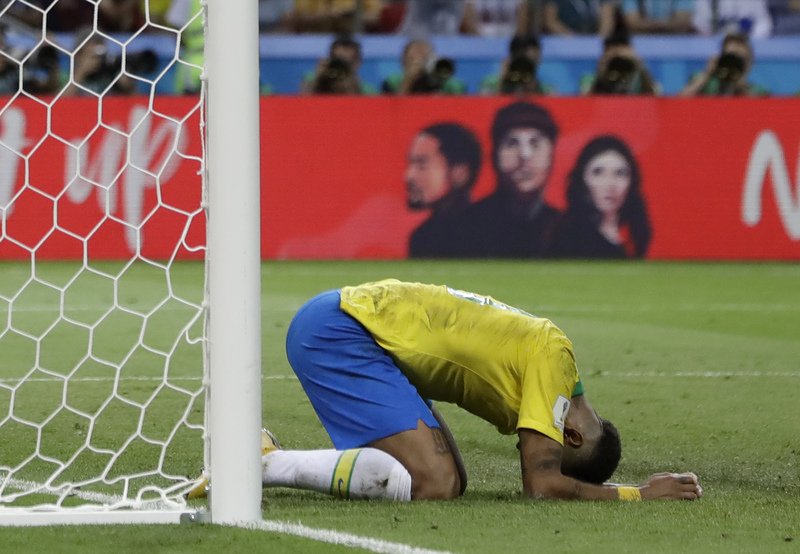 In general terms – and this is not specific to Neymar – for any player, particularly on this global stage, to overreact and not just get up and get on with it is not nice to watch. I’m sure any player guilty of such behaviour would be a bit embarrassed if they watched the incident in retrospect. Some players do more “greetin” than a Christmas card. So it’s not for me. Unless it is genuinely serious and worthy of attention from the physiotherapist or the doctor, just get up and get on with it. I was also far from impressed with the antics of the Colombia players in their match against England. After they conceded a penalty in normal time, when Carlos Sanchez rugby-tackled Harry Kane to the deck, they disputed it with American referee, Mark Geiger. At one stage he was surrounded by seven of their players, trying to pressure him into changing his mind. Their protests went on for almost four minutes. In some ways, I felt for Geiger. In other ways, he should have been stronger and immediately waved his yellow card to all of the moaners. If they didn’t take heed, then brandish the card again and send the guilty party packing. FIFA should look at taking retrospective action against Colombia. This kind of thing needs to be stamped out. It’s ugly to see. Overall, I think the referees have been more than decent. The VAR system has also worked well, and allowed for many penalties to be awarded and grappling in the box to be punished. FIFA deserve to be applauded for introducing this, and the benefits are there for all to see. Sure, it still has one or two teething problems to sort out, and a little more transparency on some decisions would not go amiss. But there is no doubt that more good than harm has come of it. Now that we have reached the semi-final stage, we are very much at the business end of the Finals. As is the case in all big tournaments, with the best players on the planet showcasing their talents, we have enjoyed some wonderful moments. An individual piece of brilliance, such as Cristiano Ronaldo’s last-gasp free-kick to earn Portugal a 3-3 draw against Spain. Team goals, like when Kylian Mbappe scored to put France 4-2 ahead against Argentina and Kevin de Bruyne’s second goal for Belgium against Brazil on Friday night. What a result that was for the Belgians, and credit to their manager, Roberto Martinez. His team went more direct in their last-16 tie against Japan when they were 2-0 down, and changing tactics and substitutions worked a treat for them. You know, even in the World Cup, you are allowed to play a long ball. It can help you win football matches, as it did for them against the Japanese. Getting back to individual brilliance, I also have to praise Mbappe’s 65-yard run to win the penalty-kick against Argentina when the score was 0-0. It was breathtaking. What a wonderful explosion of pace. Mbappe has maybe emerged as the star of the show at this stage, and to do so at just 19 is a credit to him. There is no doubt he is a special talent. With it sure to be a Final contested by two European nations, it will be interesting to see who the referee is going to be next Sunday evening. It may well be someone from a Latin American country. He will need to be strong and must have respect from the players from the first whistle. But in the next seven days, I hope both semis and the Final are entertaining and memorable spectacles. That way, we will be talking about them for the right reasons in the weeks and months ahead.